‘Om Sai Ram’ these three sacred words mark the onset of a holy journey towards Shirdi Sai Baba. 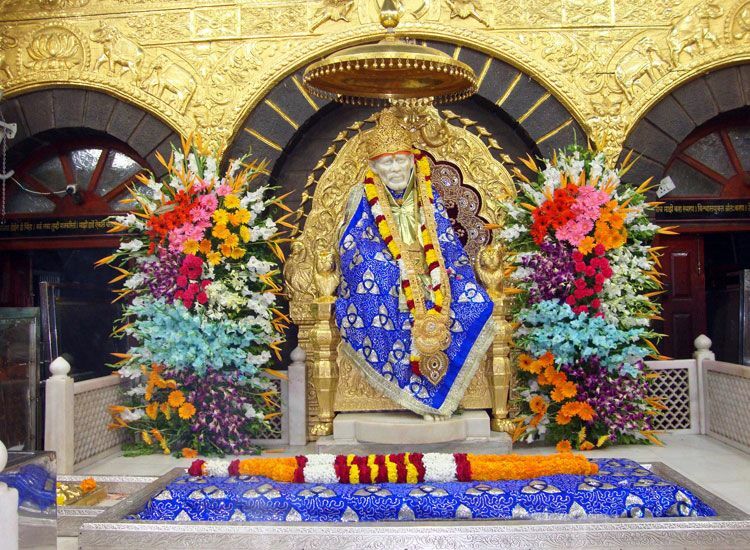 Shirdi is town in Maharashtra and prominent as the home of Saint Sri Sai Baba. Shirdi is land of Sai and houses a splendid temple to commemorate the holy soul and his noble deeds. The Shirdi Sai Baba Temple covers an area of around 200 sq. mtrs. It is one of the sacred pilgrimage destinations of India. One can worship the statue of Sai Baba inside the temple premises. Being a Fakir by nature, Sai Baba lived a simple life. It was due his miracles and deeds that this splendid temple was carved out. His charisma is so impact full that people don’t even hesitate to offer their riches to this trust every now and then. Giving a striking contrast to the sober lifestyle of Sai Baba, the Samadhi is carved out of Italian marble. Royal cloth is used to drape the idol. The statue is seen wearing a gold crown and ornate with fresh floral garlands. The facades and insides of the temple, is covered with gold. Faith of devotees of Sai Baba is so apparent here that some of his magical deeds are still alive in Shirdi and continue to mesmerize many. It is due to this only that around 25,000 people visit this holy shrine daily while there is a soar rise in the count during the religious festivals. With so much of spiritual reverence, here’s our complete guide for Shirdi Temple. Along with the complete insight, you will also come to know about how to reach, what to do and best time to visit Shirdi. A fakir, saint, satguru or Sai appeared at Shirdi at the age of 16 year. Sai Baba revamped this small hamlet into a divine place for his followers. Numerous stories of the well-known Shirdi Sai are related to this village and temple. His generous love and devotion towards the needy, earned him admiration for which he is revered even now. He left for final abode or attained his Samadhi at Shirdi in 1918. The temple was erected to preserve his miracles and preach his teachings and principles to others. In 1998-99, the need was felt to renovate the premises of the temple. At present temple comprises of basic amenities like Prasadalay (food is served round the clock), Darshan Lane, Prasad Counters, Donation Counters, and Book Stall etc. The Sansthan also offers the lodging facilities. Shirdi Sai Baba Temple is dedicated to Sai Baba. His date of birth and place of birth is still a mystery. Sai Baba’s real name is also not known. Mhalsapati conferred the name ‘Sai’ to him on his arrival at Shirdi. He took shelter in a mosque in Shirdi which is now known as ‘Dwarkamayi’. Everybody was clueless about this mysterious stranger. He used to sit under the Neem Tree and would ask for alms from others. In spite of people throwing stones at him, he practiced his noble deeds. It was after 1910 that he became prominent amongst the people of Mumbai. People from far and near started visiting him and use to witness his miracles. Sai Baba lived as a penniless fakir amidst the people. He used to wear a torn kafni and sleep over a mat. He used a brick to rest his head while sleeping. Although he used to beg food but he always wore a mysterious smile on this calm face. Sharing his limited food with animals was his hobby. Sai Baba taught the importance of self-realization and he demoted love towards immortal things. He promoted forgiveness, love, kindness, inner peace, charity, and devotion to only God. He believed in only one God which is apparent from his saying ‘Sabka Mailk Ek’. He strongly emphasized uniformity of religion and never judged anyone on the basis of caste, creed or religion. Whosoever visited him in the hour of need, was never returned empty handed. Just to ease the grief of the poor and needy, he performed several miracles. People witnessed his power when he lit Diyas without oil and made a blind man to see. This made him a prominent fakir in Shirdi. He was an incarnation of Shiva for Hindus. For Muslims, he was a fakir staying in a mosque while preaching Islam and stating “Allah Malik. All his life and his deeds were devoted for betterment of mankind! 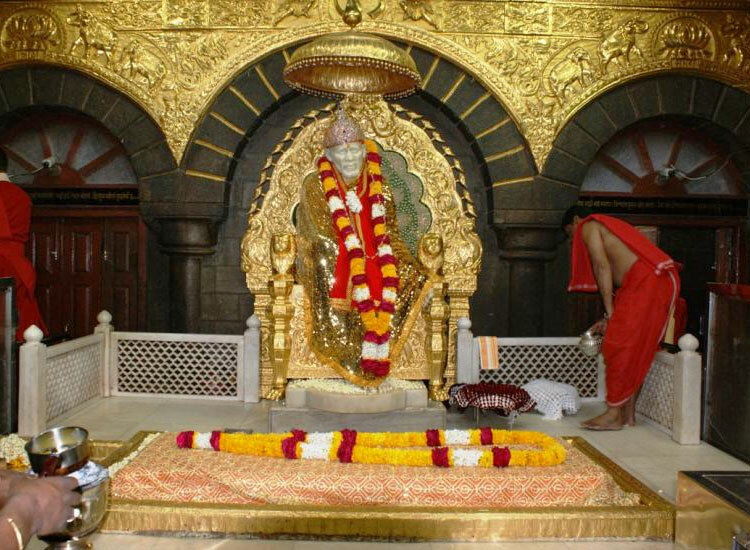 Shirdi Sai Baba Temple is most famous pilgrimage for Hindus. It is dedicated to Sai Baba and is visited by his devotees throughout the year. This is the place where Baba left for his heavenly abode. It is built by a millionaire devotee of Baba. The Samadhi is carved out of beautiful Italian white marble and adorned with many ornaments. It means – ‘Seat of the teacher’. This is the place where Baba was seen first, sitting under a Neem Tree. It is believed that lightning an incense stick here cures all the ailments. House of Sai Baba where he spent 60 valuable years of his life serving the mankind. This mosque is named after the land of Lord Krishna. The reason for doing so it to show that Baba treated all religions equally. He lit a sacred fire called as Dhuni, which is still burning here. He used the ash of this fire for treating the ailments of the people. This ash is known as ‘Udi’ and is given as Prashad to devotee who visit here. Chavadi holds a special place in the hearts of followers of Baba. It is situated in close proximity with the Dwarakamai. It is the place where Baba, along with his followers, used to sleep on every alternative night. Even today, Palki processions are carried out from Samadhi Mandir to Chavadi with great pomp and show on every Thursday. The Palki or palanquin houses the idol of Sai Baba. It starts from Samadhi Mandir, moves towards Dwarkamai and then reaches Chavadi and is finally returned to Samadhi Mandir. Baba cultivated this Bagh personally. He used to visit here daily for a walk and for watering the plants. It is believed that he used to throw some silver coins in the Lendi, meaning well, which is still present here. Baba also dug a 2 feet deep well and placed a continuously burning earthen lamp there. While these are the places to see inside or nearby to the temple, devotees can also pay homage to some of the pilgrimages around the temple. The list includes Shani Shingnapur Temple, Adul Baba Cottage, Shri Khandoba Mandir, Maruti Mandir and so on. It is a privilege for a devotee to attend Sai Baba’s Aarti. People from far and near gather around the temple to be a part of this sacred act and show their devotion towards their God. Going with the traditions and following the rituals of the Sai Baba’s time, four Aarti are conducted within the Samadhi Mandir. By Road – Shirdi is well connected via Road Networks. It is situated on Highway of Ahmednagar – Manmad and could be easily reached from Mumbai (250 km), Nashik (75 km) and Pune (157 km). Devotee visit Shirdi Sai Baba Temple to pay homage to Sai Baba throughout the year. But December to February is the best time for this pilgrimage. Many other processions and Pooja keep on taking places in between these. Visit this holy pilgrimage once and witness the unity in diversity at Shirdi Sai Baba Temple.